The Penny Game is a simple lean game I've written about before. For the low price of 20 cents, you can teach lean. The Penny Game shows how small batches are more efficient using 20 coins. In the last few months, I've come across a few variations and tweaks of the basic game. First, Jim Ralston presents a streamlined and updated variation of the Penny game on his blog. He describes it as a "Kool-Aid", meaning this game will quickly win converts to lean! Drink the Kool-Aid and join us! In Jim's version, there's no change to the actual method. You still flip pennies over in batches and pass them to the next person. 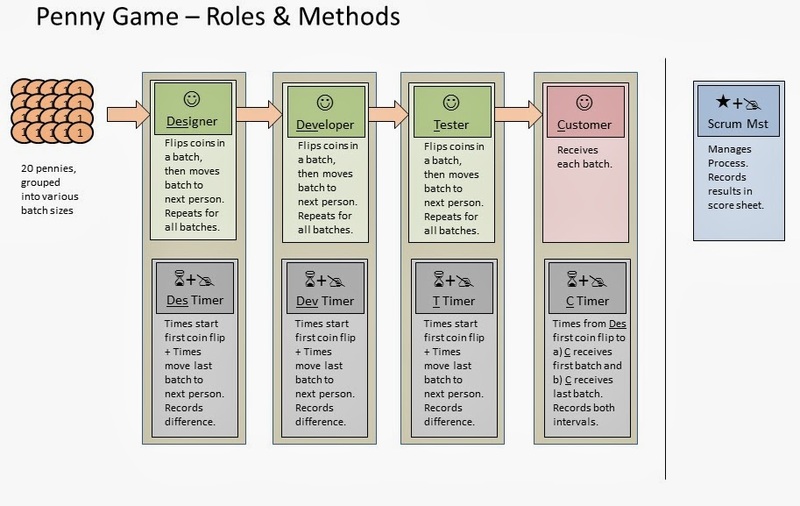 But he's made it more relevant to software development by assigning specific roles to each participant. There's a designer, developer, tester and scrum master. And, of course, there's a customer! This variation shows how easy it is to take a simple game and make it your own. By tweaking the Penny Game descriptions, Jim has made it easier for people in his particular business to drink the lean Kool-Aid. If you're in the software biz, it may be worth your time to download Jim's role diagram below and check out his analysis on his site. If you're not into software, take a cue from Jim and tweak it to your own process. Next is something a little more in depth. How about a 173 page slide show of the Penny Game in action? The slideshare embedded below is perfect for anyone that wants to get a feel for the Penny Game, but doesn't have a group to try it on. After the introductory pages, each slide represents one flip or move of a penny. This way you can scroll through them and see how the game works, step by painstaking step. If you go really fast, it almost looks like it's animated, like a flip book. Before trying out the Penny Game with your group, it's worth giving this slideshare a quick flip through, and see the difference smaller batches make. 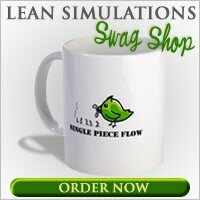 For more lean games and simulations like this, check out my huge page of free lean games! Hi, when looking Marcus's penny game, it seems that 1 tick was not counted when passing the batch over, during the 3rd trial. Was that made deliberate to explain transport waste savings? no that is probably just a slip up from me. Sorry. Thank you for you keen eyes! How do you time "how long each person worked" with one piece flow? You would have to start/stop the timer 20 times for each person, no? Since your auto's title will be set up against the credit, you have to display evidence of proprietorship. You additionally need to at any rate have references one of which must be an individual from your family. with their proprietors. In order to train their canines to search alldogharnesslock and protect, the ancient Egyptians used collars Best Dog Harness and also chains that were handcrafted.